“Live a little, Mandy Rose. You never know when life will take a sudden change.” (Kindle Locations 1745-1746). Amanda Rose has a pathological fear of upsetting people and a fear of screwing up. Ever since the incident with her sister Alexa, Mandy has made sure to be the Goody Goody and not mess up, but she’s sick and tired of trying to be perfect. “I get straight A’s. I’ve got this great cooking club going, Nourishing Nosh, and I’m planning to put up a cooking and nutrition website for kids, NourishingNosh.com. I’ve got a plan for my future as thoroughly mapped-out as the garden I’m going to plant.” (Kindle Locations 790-794). Inside, Mandy knows there is something missing in her life, that there is something hiding in the very depths of her soul. When she makes her birthday wish, she is surprised to find that it wants to come true, or at least take her down a path to figure out what secret she is hiding from herself. Her wish takes the form of her childhood imaginary friend Lexi, who is guided by the Wish Mistress Desiree. Mandy was annoying, Desiree was annoying, switching POV made the book annoying, the shallow romance was annoying. The message in the book was shallow and pushed again and again. 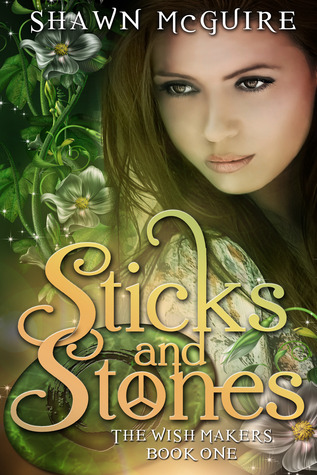 There was a wonderfully captivating fantasy story within Sticks and Stones, but it got buried beneath these annoyances. I felt like many scenes, especially in the beginning, were dragged out with too much detail in the wrong places. McGuire was overly wordy where it wasn’t necessary. I could feel the story wanting to hit the initial conflict or triggering action, but was held back by too much exposition. When the story hit, I was eager to read more, but then McGuire sideswipes the story entirely to nearly abandon the main character and focus on Desiree the Wish Mistress. I didn’t want to know more about Desiree. She was a part of Mandy’s story, but she wasn’t an important enough character to warrant her own chapters with a storyline apart from Mandy’s. The POV switch was the most aggravating choice the author made for the novel and I eneded up skimming and skipping almost all of Desiree’s short chapters. They were dull and meaningless in the scope of the overall story. Desiree is a messenger in Mandy’s story and didn’t warrant or deserve as much focus as she got. The story was intriguing, regardless of the annoying points; however, I don’t feel that I would read anymore from this author because of the choices she made in Sticks and Stones. This novel was published by Brown Bag Books June 12th, 2014 and is available on Amazon here.